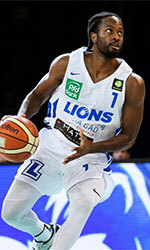 Saenz Horeca Araberri (LEB Gold) inked Congolese international guard Mathieu Kamba (196-95kg). Kamba has a double citizenship as he also holds Canadian passport. Kamba just graduated from Cent.Arkansas (NCAA). He has played there for the last four years. A very good season in his career as he was selected to All-Southland Conference Honorable Mention. As mentioned above Kamba is just out of the college and it will be his first season in pro basketball. He was called to Congolese Senior National Team this year.